All Wi12 attendees are invited to participate in the Backlist Book Swap Party, sponsored by HarperCollins and Harlequin. Come with a copy of your favorite book to share with friends and colleagues; leave with someone else's. Books should be at least five years old and still in print. Suggestions for topics include regional titles, books with strong female characters, and books set in winter. 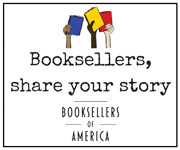 Please let ABA know what book you will be swapping by completing this form, and don't forget to bring a bookmark from your store -- with a way to contact you -- to include with your book, so you can find out who picked your swap. To add to the fun, we are expanding the swapping to include store bookmarks. Leave one in your donated swap book, and bring 50 or so more to share with your colleagues. We will display them at the party; this is your opportunity to exchange, borrow, and steal good ideas. And be prepared to vamp: the Backlist Book Swap photo booth will be in the building!